KENNEDY SPACE CENTER, FL--A Russian Soyuz capsule carrying three of the International Space Station's six crew members suffered an unexpected communications black out just before plunging back into Earth's atmosphere late Thursday, completing a nail-biting descent in radio silence with repeated calls from flight controllers near Moscow going unanswered. Finally, recovery crews in Kazakhstan spotted the Soyuz TMA-21's braking parachute, communications with ground crews were established and the spacecraft touched down at 11:59:39 p.m. EDT (GMT-4) Thursday, tipping over on its side as it closed out an expedition lasting 164 days five hours and 41 minutes since launch April 4 from the Baikonur Cosmodrome. "The Soyuz TMA-21 has landed," Rob Navias, NASA mission control commentator in Houston, reported. 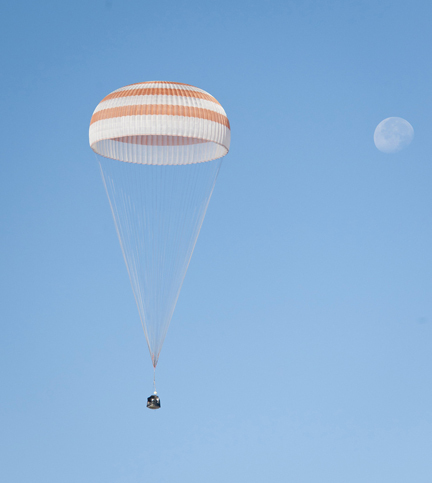 "A bulls-eye landing for the Soyuz TMA-21, 10 a.m. Kazak time Friday morning." Russian recovery crews, along with NASA flight surgeons and space station program managers, were standing by to help Soyuz commander Alexander Samokutyaev, Andrey Borisenko and NASA flight engineer Ronald Garan out of the cramped descent module as they begin their re-adaptation to gravity after five-and-a-half months in space. All three men appeared relaxed and in good spirits as they rested in recliners near the scorched descent module, smiling and chatting with recovery crews. 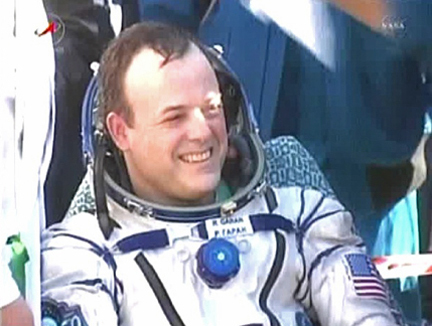 Borisenko, the last of the three to be pulled from the spacecraft, flashed an enthusiastic thumbs up. After satellite phone calls to family members and quick medical exams, the station fliers were to be flown to Karaganda for an official welcome home ceremony. From there, Garan planned to fly back to the Johnson Space Center in Houston aboard a NASA jet while Borisenko and Samokutyaev were expected to fly to Star City near Moscow for debriefing and the start of rehabilitation. There was no immediate explanation for the communications drop out, but the repeated, unanswered calls from mission control near Moscow were eerily reminiscent of the fruitless calls to the shuttle Columbia during the orbiter's ill-fated descent to Earth in 2003. But the Soyuz TMA-21 spacecraft completed its return to Earth safely, if in near silence, and all three crew members appeared to be in good health. 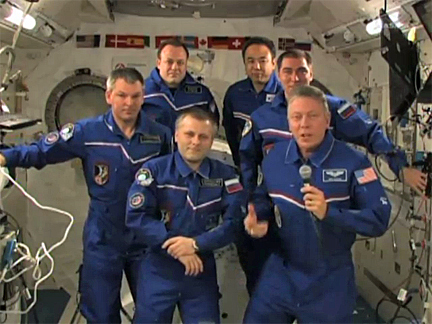 Re-entry preparations began early Thursday and the departing station crew members bid farewell to Expedition 29 commander Mike Fossum, Sergei Volkov and Japanese astronaut Satoshi Furukawa just after 5 p.m.
"Well guys, it's hard to believe. It's time," Fossum said. "It's time, you've been up here almost six months, we've learned everything from you we could possibly learn and now it's time to say goodbye. "We don't want to see you go, we like the company, we love the friendship. And like we said the other night, we're like brothers, and we've lived together closer than families in many ways. So thank you very much, and we wish you all the best and soft landing. We cannot wait to see your faces back on Earth." 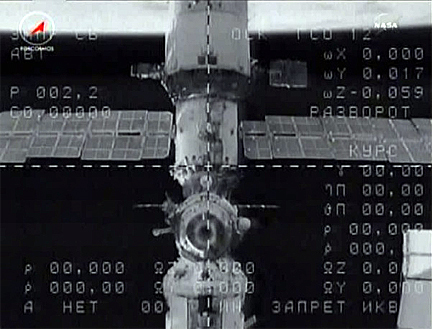 A few minutes later, Samokutyaev sealed the hatch leading to the Soyuz TMA-21 spacecraft and, after donning pressure suits and carrying out leak checks, the crew undocked from the Russian segment's upper Poisk module at 8:38 p.m.
"You look great backing away, guys," Fossum radioed as the spacecraft slowly departed. "It's been great sharing space with you. Safe journey and soft landing, my friends. Godspeed from the International Space Station." Flying on their own about 12 miles from the lab complex, Samokutyaev monitored a computer-orchestrated four-minute 20-second rocket firing starting at 11:05 p.m. that slowed the ship by about 258 mph, dropping the far side of the orbit into the atmosphere for the fiery descent to Earth. Just before atmospheric entry, radio contact was lost. Fossum and his crewmates originally expected to welcome three fresh station fliers aboard on Sept. 24. But launch of the Soyuz TMA-22 spacecraft carrying Anton Shkaplerov, Anatoly Ivanishin and NASA flight engineer Dan Burbank was put on hold pending resolution of a third stage failure Aug. 24 that triggered the destruction of a Soyuz-U rocket carrying an unmanned Progress supply ship. The Soyuz-U and the Soyuz-FG rocket used to launch manned missions use virtually identical third stages. Engineers have traced the Soyuz-U engine failure to a kerosene fuel line blockage that disrupted the operation of a turbopump used to feed propellants to the main combustion chamber. A Russian commission investigating the failure reportedly has raised questions about quality control. But it's not yet clear how that issue will be resolved. But during a weekly program planning meeting Thursday, Russian managers told their NASA counterparts they hope to launch another Progress supply ship on Oct. 30. If that goes well, they plan to press ahead with launch of the Soyuz TMA-22 spacecraft carrying Shkaplerov, Ivanishin and Burbank at around 12:50 a.m. EDT on Nov. 14, setting up a docking two days later. Fossum, Volkov and Furukawa, launched to the lab complex June 7 aboard the Soyuz TMA-02M spacecraft, originally planned to come home Nov. 17. They are now targeting re-entry and landing for around dawn on Nov. 22, just one week after Burbank's crew arrives. Three fresh crew members -- Oleg Kononenko, Andre Kuipers and NASA flight engineer Donald Pettit -- hope to blast off aboard the Soyuz TMA-03M spacecraft sometime between Dec. 20 and Dec. 26, more than three weeks later than planned. Assuming that schedule holds up, Burbank's crew will see their mission cut short by two months while Pettit's crew will lose about a month. In any case, the timing of the crew rotation flights is crucial because Fossum and his crewmates must return to Earth by Nov. 22 at the latest or they will be faced with landing at night, which is a violation of Russian safety guidelines. If Burbank's launch is held up much beyond Nov. 14, station managers could be faced with the prospect of bringing Fossum's crew home as planned and leaving the lab complex unmanned. Procedures are being developed to safely "de-man" the station and operate it from the ground if the Soyuz rocket problem takes longer than expected to resolve. NASA managers are hopeful it won't come to that, but the margin is razor thin. "Our top priority is the safety of our crew members," space station Program Manager Mike Suffredini said in a statement Thursday. "The plan approved today, coupled with the conditions on orbit, allow the partnership to support this priority while ensuring astronauts will continue to live and work on the station uninterrupted. "Our Russian colleagues have completed an amazing amount of work in a very short time to determine root cause and develop a recovery plan that allows for a safe return to flight. We'll have a longer period of three-person operations and a shorter than usual handover between the next two crews, but we are confident that the crews will be able to continue valuable research and execute a smooth crew transition."